I have wanted to try Zumba for a while now. It's been on the top of my list of things to try. But because of the kids and Avery's school schedule and Jon's work schedule I didn't want to commit to going to a class. My next best thing was a Zumba video or Wii game! 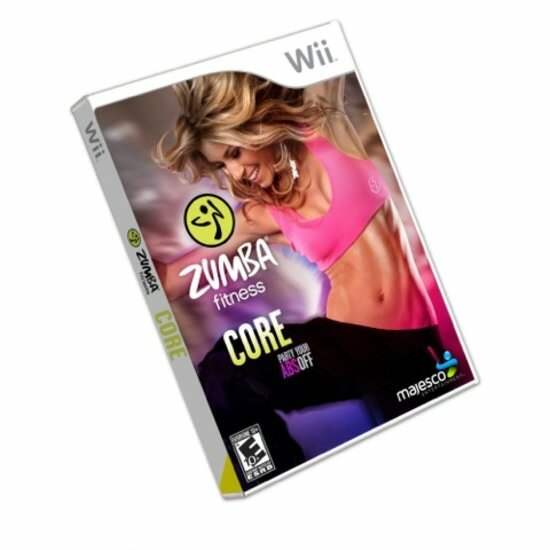 So I contacted them and they sent me a Zumba Core Wii game! I love this game if you want to call it that. It's more of a workout dvd type. I love that you can choose a song list that you want to play while you're doing your workout. This is the Core game which is meant for your middle section, your abs per say. I love that it comes with a belt so you can put the Wii remote inside it and it tracks all your movements and makes sure you're doing them right. This game is pretty darn awesome and addicting. It's nice when a workout can become addicting. If you've heard anything about Zumba, you've probably heard that it's no joke and it's a real workout? Boy were those people right. It's a real true workout. You will be out of breath and your abs and legs will hurt the next day, but it's so nice and the results are worth it. I've had this for about 5-6 weeks now. I use it an average of about 2-3 days a week and although I'm not noticing a major difference right now, I have lost 1" in my waistline! So it must be working!!! Price: This game is $40. It also comes in a Kinect version for $40. Overall: ***** love this game! The DVD sets are awesome!!!! I like that you can get the toning sticks. The video game is, of course, my favorite thing on the website though. I like their Z-KICKZ II in blue! I like the toning sticks, to really boost the workout! I love the Bliss Capri Leggings. I like the Darling Lounge Pants. I didn't know they had clothes! I love their tank tops! i love the electro cargo pants! I love the Z-KICKZ ORIGINAL. I would love one of the dvd sets someday. I love their cargo pants and V bras! I love the pop racerback top! Love the FEELIN IT CARGO PANTS in Geranium!! I like the Feelin It Cargo Pants. The FLAUNT IT RACERBACK in Zumba green looks so cute! I like that you can get a DVD too. Thanks so much for the fantastic giveaway and happy holidays! I like the Strut Leggings. I like the Z-Kickz II. I have the toning sticks but do not have the video or the game. I'd love to get the DVDs so I can shake it at home on the days I can't make it to the gym! I really like the Flare Headliner Top! ah! their clothes are so cute! I like the feelin it purple cargo pants. I had no idea they had clothes, really excited about that. I love zumba because it doesnt feel like you are working out until after your done. Its a ton o fun! I like the flair long sleeved top. I see they also have Zumba Core for Kinect! That'd be awesome! I like the DVD sets. ZUMBA RUSH VIDEO GAME ON KINECT FOR XBOX 360 looks pretty cool. I like the DVD, then I could do it anywhere. I like the Flare Headliner Top. I do a class. This would be cheaper. I just got a wii and would love this! I like the bady shaping system. Video games so you can work out at home. I like the Suave Sweatpants. I like the Zumba Gold live it up 3 DVD set. This is awesome, I was just looking at this game yesterday! And next time, I will not hit the post button before I am done :) I LOVE the cargo capri pants! Have been thinking about getting one of these... I would be interested in the Core Wii game. Thanks! I love the Zumba Exhilarate Body Shaping System - 4 DVD Set Plus Bonus! I love the Twist Leggings in pink. I like their lounge pants. I like the toning sticks. Thanks for hosting! I like the clothing line. Crave zip up hoodie would be great for my wife. I've never tried it, but it sure looks like fun!